Shiny Exeggutor Happy in game: 37 Who? Important notice! Pokemon Shiny Exeggutor Happy is a fictional character of humans. 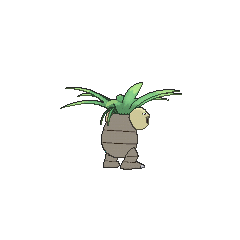 Exeggutor (Japanese: ナッシー Nassy) is a dual-type Grass/Psychic Pokémon introduced in Generation I. It evolves from Exeggcute when exposed to a Leaf Stone. In Alola, Exeggutor has a regional variant that is Grass/Dragon. It evolves from Exeggcute when exposed to a Leaf Stone. All Exeggcute in Alola evolve into this form regardless of their origin. Exeggutor is a tall, bipedal Pokémon that strongly resembles a coconut palm or other palm tree. Its legs and body resemble a tree trunk, and its legs are thick with two-toed feet and a light yellow paw pad on each foot's underside. 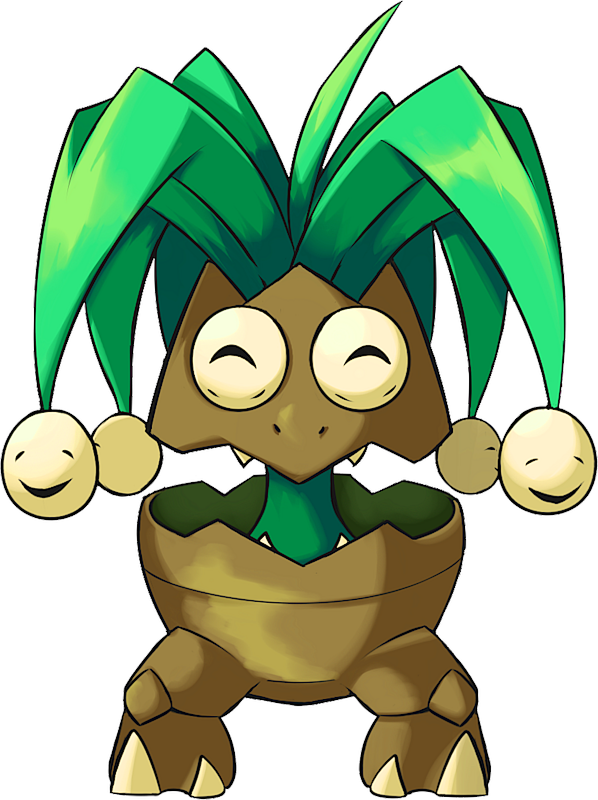 It has leaves sprouting from the top of its body, and Exeggutor has three to six round, light yellow heads that resemble coconuts, each with differing facial expressions. Each head thinks independently of the others, so it makes a lot of noise as each head speaks its mind. 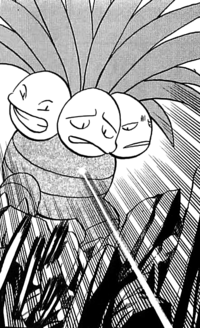 If one of these heads grows too large, it falls off and groups back together to become an Exeggcute. In the anime, Exeggutor also has been seen in groups of its own kind, meaning that it is not a solitary Pokémon. It lives in forests and jungles. Due to the abundance of sunlight in the Alola region, Exeggutor grows over five times taller than in other regions. Its neck is thinner and much longer, causing it to resemble a palm tree. 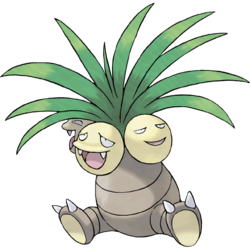 This variant of Exeggutor has a long, tapering tail with two leaves and a fourth head on the tip. This extra head can act on its own and defend the rear. Its long neck can be used like a whip to attack enemies with its hard head. However, its neck can also be a weak point. 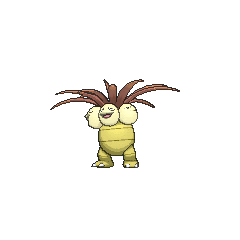 The people of Alola claim that Alolan Exeggutor is this Pokémon's true form. Exeggutor and its pre-evolved form are the only known Pokémon that can learn Barrage. Ash was hypnotized by Melvin's Exeggcute in The March of the Exeggutor Squad, and was forced to capture several Exeggutor for Melvin. Unfortunately, all of the Exeggutor used Hypnosis on each other and they went on a rampage. Ash battled an Exeggutor in his first battle in the Indigo Plateau Conference in Round One - Begin!. Despite the type disadvantage and the lack of experience, Ash's Krabby defeated Mandi's Exeggutor, evolving into Kingler in the process. It reappeared in a flashback in the following episode and in another flashback in Friends to the End. An Exeggutor appeared in Pikachu's Rescue Adventure after evolving from Exeggcute. In Misty Meets Her Match, Rudy used an Exeggutor against Ash's Bulbasaur. Bulbasaur managed to defeat it, but it also saved the Coconut Tree Pokémon from falling down a cliff. Eight Exeggutor were among the inhabitants of an oasis just for Pokémon in Got Miltank?. They were the ones responsible for keeping the humans away by hypnotizingthem. An Exeggutor appeared in Reversing the Charges battling an Elekid. An Alolan Exeggutor appeared in The Guardian's Challenge! at the Pokémon School during Samson Oak's lesson about regional variants. Exeggutor first appeared in The Battling Eevee Brothers. Multiple pink Exeggutor resided on the Pinkan Island in In the Pink. Multiple Exeggutor also appeared in The Power of One. An Exeggutor was one of the Pokémon seen at the Pokémon Swap Meet in Tricks of the Trade. Three Exeggutor were among the Pokémon living in Len Town in The Psychic Sidekicks!. An Exeggutor appeared in Beauty and the Breeder where it participated in a Pokémon breeding competition. A Trainer's Exeggutor appeared in The Grass Route competing in the Grass Tournament. An Exeggutor was part of a Pokémon street festival in Doin' What Comes Natu-rally. In Extreme Pokémon!, an Exeggutor appeared with its Trainer, participating in the Extreme Pokémon Race. An Exeggutor was one of the Pokémon seen in a forest outside the Ice Path in EP250. In A Claim to Flame!, Ash's Cyndaquil battled against a Trainer's Exeggutor in a qualifying match for the Silver Conference and won. A Coordinator's Exeggutor appeared in Pruning a Passel of Pals! participating in the Battle Stage of the Wallace Cup. Two Exeggutor made cameo appearances in Giratina and the Sky Warrior. An Exeggutor appeared in Zoroark: Master of Illusions. Another one appeared in The Journalist from Another Region!. Multiple Exeggutor appeared in Thawing an Icy Panic!. The Alolan Exeggutor made its debut appearance in Alola to New Adventure!. EP043 Exeggutor Ash's Pokédex Exeggutor, a Coconut Pokémon. Also known as "The Walking Tropical Rain Forest." Each coconut has a distinct face and its own character. Its special attack is Hypnosis. Blue used an Exeggutor against Red's Dodrio in the Pokémon League in File 4: Charizard and won. It later lost to Red's Persian. Exeggutor first appeared reuniting with its trainer in Buzz Off, Electabuzz!. In Extricated from Exeggutor, multiple Exeggutor were some of the Pokémon seen during the mass migration of Pokémon at the Seafoam Islands. They appeared again in a flashback in Really Remoraid. In Rock, Paper...Scizor, Exeggutor is one of the Pokémon Blue captures outside the Viridian Gym. It is seen again in Entranced by Entei as a part of his squad in the Gym Leader faceoff, and again as a defender of Viridian Gym in Secrets from Sneasel. 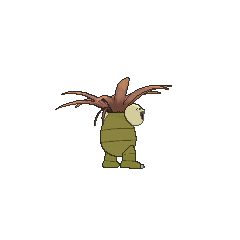 Another Exeggutor was one of the Pokémon sent to help the fight in Ilex Forest in The Last Battle XIII. Prior to My, My, My Mimic, Bill's Exeggcute has evolved into Exeggutor. It was seen in Icefall Cave being targeted at by Blue, testing out the Vs. Seeker. Giovanni sends out Exeggutor to prevent Red from interfering with his plans on breeding Mewtwo in Bring Down the Strongest Pokémon!!. An Exeggutor is seen with Red during the curry cooking competition that went on in Curry Showdown! Which is the Most Delicious?. Will has an Exeggutor which was used against Red in his challenge of the Johto Elite Four in A Challenge to the Elite Four!. Rudy's Exeggutor was defeated by Ash's Bulbasaur when it was put to sleep by its Sleep Powder. Legend has it that on rare occasions, one of its heads will drop off and continue on as an Exeggcute. Its cries are very noisy. This is because each of the three heads thinks about whatever it likes. Each of the fruits is an independently-thinking head. It is said that if one drops off, it becomes an Exeggcute. If a head drops off, it emits a telepathic call in search of others to form an Exeggcute cluster. Originally from the tropics, Exeggutor's heads grow larger from exposure to strong sunlight. It is said that when the heads fall, they group to form an Exeggcute. It is called "The Walking Tropical Rainforest." Each of the nuts has a face and will of its own. Each of its heads has its own will. They use telepathy to discuss their plans before coming to a joint decision. When the time comes, one of its three heads falls off. Before long, the fallen head grows into an Exeggcute. Moves marked with a superscript game abbreviation can only be bred onto Exeggutor in that game. 51%-100% HP Let's go get 'em! I agree! I agree, too! 26%-50% HP Only half the HP is left! It's half! It's half! 1%-25% HP I can't anymore! Neither can I! Nor me! Level up Leveled up! Leveled up! Leveled up! Sometimes clears away three black-cloud disruptions. 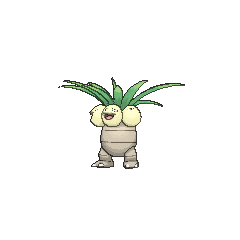 For other sprites and images, please see Exeggutor images on the Bulbagarden Archives. Two of Ash's Pokémon in the anime have evolved after fighting and defeating Exeggutor. Ash's Charmander evolved into Charmeleon after defeating several Exeggutor, with some help from Melvin's fire power. Later on, Ash's Krabby evolved into Kingler after defeating Mandi's Exeggutor in the first round of the Indigo Plateau Conference. Exeggutor is Tsunekazu Ishihara's favorite Pokémon. He used it all throughout the debugging and testing of Pokémon Red and Green. The artwork for the Japanese Jungle (TCG) booster box depicts Exeggutor with an elongated body and no visible legs. Alolan Exeggutor is the tallest Grass-type and Dragon-type Pokémon, as well as the heaviest Grass-type Pokémon. It appears to be based on a coconut tree and possibly the Japanese monster Jinmenju, a tree that grows human heads (that are always smiling). It might also be inspired by a sandbox tree. Exeggutor's Alola Form more closely resembles a coconut tree. Its type may be a reference to the Dracaena genus. It may also be a pun inspired by the Coca, a dragon whose name shares the same origins as the word coconut. Exeggutor may be a combination of egg and executor. Nassy is derived from ココナッツ kokonattsu (coconuts) and 椰子 yashi (palm tree). Cantonese Chinese 椰樹獸 Yèhsyuhsau Literally means "Coconut tree beast"